Clear Plate Polycarbonate/Acrylic Panels are a low cost, fast solution to immediately reduce heat loss though your existing glazing. Standard Rectangular Glazing Panels (for Secondary Glazing) allow YOU to cut your panels to your exact requirements. The alternative is to choose Cut-to-Size panels where you specify your exact requirementsare. Acrylic and Plate Polycarbonate is supplied in 2mm, 4mm and 6mm thicknesses and can be used with a variety of different fitting regimes. If the intended use of these panels is for secondary Glazing you will need to decide how these panels are to be fitted. 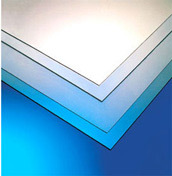 Plate Polycarbonate is the stronger material (250 times stronger than Glass). Acrylic is slightly cheaper, but is much harder to work with and is very susceptible to shattering. We would always recommend Plate Polycarbonate as the material to use. Cut-to-Size Panels are guaranteed for 10 years. Standard Rectangle Panels for Secondary Glazing - Omega Build supply a range of roofing components such as Standard Rectangle Panels for Secondary Glazing, diy conservatory roof kits, polycarbonate roofing sheets, polycarbonate canopy kits and much more. You are currently browsing the Standard Rectangle Panels for Secondary Glazing category of our polycarbonate sheets and canopies shop.